Canadian Prime Minister Justin Trudeau, left, and President Trump, at the White House in October 2017. The two leaders on Friday discussed by phone North American Free Trade Agreement negotiations and bringing the talks to a timely conclusion, Trudeau's office said Friday. 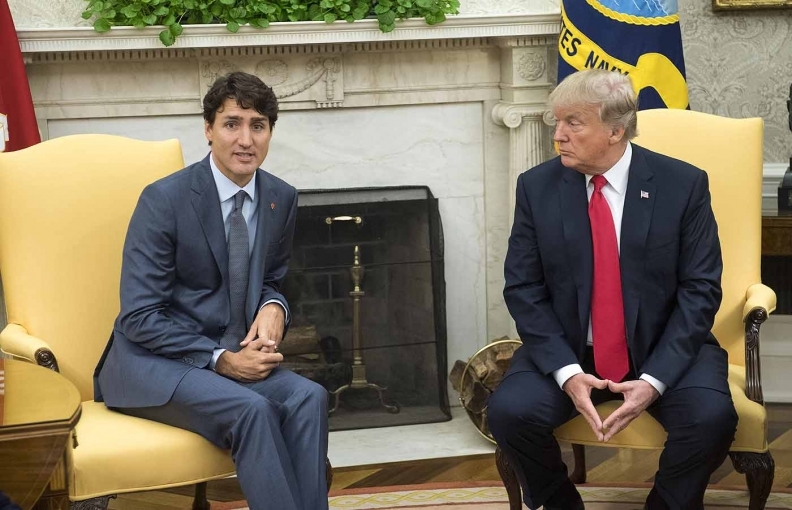 OTTAWA — Trudeau spoke with U.S. President Donald Trump on Friday about bringing the negotiations to a timely conclusion, a day after the prime minister had a similar chat with Mexican President Enrique Pena Nieto. A Canadian government summary of the discussion says Trudeau also mentioned his “strong concerns” regarding the U.S. threat to slap tariffs of up to 25 per cent on vehicle imports, given the integrated nature of the two countries' auto industries. Trump recently asked his commerce secretary to consider whether imports of automobiles and auto parts threaten national security, saying such core industries are critical to American strength. Trudeau told reporters Thursday he planned to tell Trump the move would have an "incredibly negative effect" on the American economy. The prime minister added the U.S. move likely stems from the difficult efforts to rewrite NAFTA. The federal NDP said Canadian workers are concerned about how the U.S. investigation will affect Canada's automotive industry, particularly due to the instability auto workers have been feeling since NAFTA renegotiations began. “This is deja vu all over again for what we have seen in our steel and aluminum industries, including in my region of Saguenay-Lac-St-Jean,” said Quebec MP Karine Trudel, the NDP's deputy international trade critic. Washington has also pushed to alter NAFTA's dispute-resolution system and include a sunset clause that would allow countries to leave the agreement after five years.